Student Scoring: Save student responses from previous years. Show a sample response on the overhead (without student name) and ask small groups to decide what score the response would get and why. Lead a discussion about what is missing from the response and have students suggest what might be added to get the highest score. Peer Editing: Pair students to read each other's response, assign a rubric score and make suggestions or comments. Write-On Bulletin Board: Regularly display student work that exemplifies the best response to open-ended questions. Try to include different strategies for organizing information (table, graph, list, drawing, factor tree, etc.) so that students consistently see proof that there are MANY right ways to respond. Students are accustomed to editing their first drafts in language arts, reworking their writing to craft a better response. Regularly include these practices in math class. After writing, students should use the rubric to examine their response and annotate, clarify or reorganize, as needed, to craft a tight response. Students should be encouraged to use words, pictures and/or numbers to capture their thinking process in these open-ended questions. They must also understand that there are many different ways to achieve a perfect score as long as they accurately show their thinking toward a correct answer. Math Portfolios: Keep folders of students' open-ended problem solving with first draft, revised draft and annotated rubric attached. Math Word Wall: Encourage students to check that they have used the best math words and that they have spelled them correctly. Writing Conferences: Conference with students to review their responses and provide detailed feedback on what they did correctly and/or how they might improve their response, as per the rubric. Students will complete open-ended problems in both classroom and state testing situations, most likely under timed conditions. Teachers should continue to use a combination of the writing process approach (to grow better math writers) and the independent response situation, in which students must apply good practices to producing their best responses under test conditions. A combination of these approaches, used throughout the school year, is the best instruction and preparation for state testing. See Mathwire Problem Solving Resources for open-ended problems organized by grade levels and math standards. Many schools celebrate the birthday of Theodor Geisel, better known as Dr. Seuss. Consider adding mathematical activities to these celebrations. One fish, two fish, red fish, blue fish is an especially good introduction to combinations. Use the Mathwire open-ended problems written to accompany this book. The problems may be used with older grades who enjoy hearing their childhood book read aloud. Seussical Patterns: Primary students will enjoy completing the Seussical Patterns which feature the classic red and white striped Seuss hat. See the Mathwire March 2008 issue to preview and download these activities. Shamrock Paths challenges students to use Pascal's Triangle to figure out how many different ways there are to spell Shamrock. Included in the PDF file are an explanation of how this problem relates to Pascal's Triangle and the numerical solution to the challenge. Shamrock Patterns requires students to rotate shamrocks to complete the pattern. Download some copies of Extra Shamrocks for students to cut apart and glue on to complete the patterns. Top of the Morning challenges students to identify the 100th and 1000th letter that will be printed on the electronic signboard. Data Collection (Small Sample): This simulation introduces students to the marketing strategy of packaging toys in cereal boxes to increase sales. In this activity, one of six different toys is packed in each box of cereal on the assembly line. Equal numbers of all six toys are available at all times on the shelves of grocery stores, but the toys are randomly distributed in those boxes. Students are asked to estimate how many boxes of cereal the average family would have to buy to get all six different toys. Students share estimates and their reasoning and these are recorded before the simulated data collection using one die to produce the outcome of getting six different toys. This is an important step in the activity so be sure to allow adequate time for students to discuss their predictions. Afterwards, students add data to the class results for analysis and discussion of this larger sample. Data Collection: Read more about the Cereal Toy Investigation for data collection suggestions and to download student worksheets. Data Collection (Larger Sample): After students have completed the simulation, allow time for students to collect data for a larger sample by using the Mathwire Online Cheerios Investigation Simulator. Students click on the Next Box tab to "buy" boxes of cereal and see what prizes they have gotten in each box. The applet lists how many boxes have been bought and how many different toys the student currently has. Once the student gets the sixth different toy, he/she should copy down the total number of cereal boxes and add that to the class data for analysis. After recording the total boxes for that trial, students click the Reset box to clear the data and run another trial. Try the Mathwire Cereal Applet. NOTE: Java must be enabled on the computer in order to run this applet. There are many different ways to organize data: graphs (bar, line, circle, glyph, etc. ), line plot, stem-and-leaf plot, table, list, picture, etc. Be sure to meaningfully plan opportunities for students to use these different methods in problem-solving exercises. As part of class discussion, display different student responses on the overhead or whiteboard, commenting on how one student used a table and another used a graph, etc. 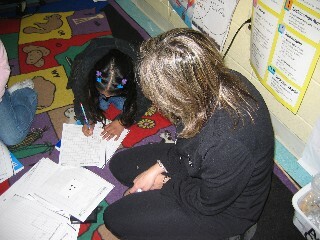 At times, teachers might encourage students to use a table or draw a graph, etc. so that they demonstrate proficiency in using the different approaches. 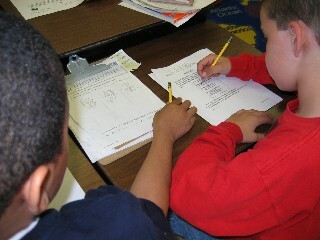 Students use higher-order thinking skills when they write original problems similar to those they have done in class. Have students proof and solve each other's problems before publishing them on the computer, along with the author's name and the date. These problems may be used as do-nows, homework assignments, or placed in the math center. Teachers who regularly include student writing find that students are highly motivated to solve problems created by their peers AND teachers develop a larger bank of appropriate word problems over time. Check the New on Mathwire.com webpage to see what's new on the site this month. Check the Recent Additions to Mathwire.com webpage to see the most recent additions to the site this month. New to Mathwire.com? There are several ways to search the site for activities by Math Standard, Math Topic, or using an alphabetical search. See Searching the Mathwire.com Site for a thorough explanation of these search options. 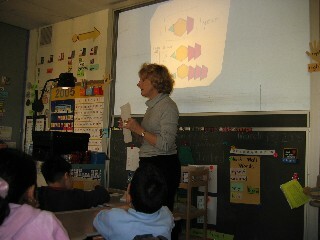 Mathwire.com is designed to provide activities and appropriate worksheets for teachers to use in their classrooms. All activities and worksheets support the constructivist approach to learning mathematics and the NCTM Standards. Activities: The activities on this site were developed by Terry Kawas and the teachers in districts where she has worked as a math consultant and coach or with students she has taught in college math-methods courses. The activities are classroom-tested by teachers and appropriate modifications have been made to reflect this field-testing. These activities are posted online in an effort to share quality activities and routines within the mathematics community.